This post is circulating on social media with wrong claims saying Rs 350 will be deducted from your bank if you do not vote in elections. Please find more details at the verification section below. 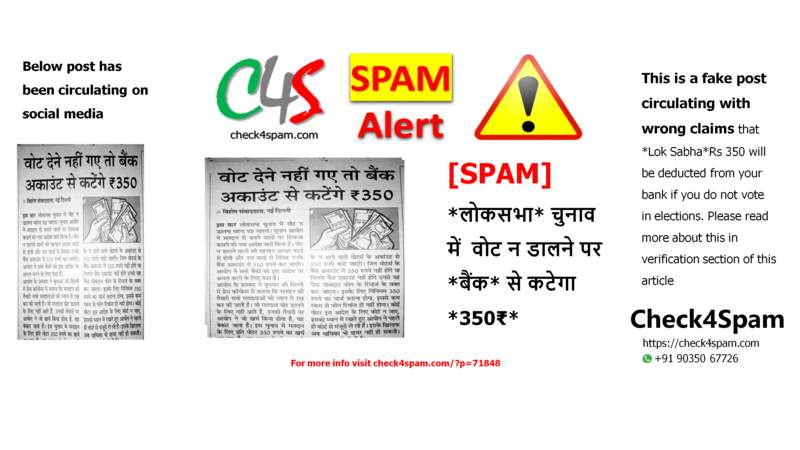 *लोकसभा* चुनाव में वोट न डालने पर *बैंक* से कटेगा *350₹* ( *Lok Sabha* Rs 350 will be deducted from your bank if you do not vote in elections ). This was published by NavBharat times on 21st Mar 2019 as holi post. In the last they have mentioned that there is no truth in this post.